Russian-born director Victor Vicas made most of his films in Germany, but this is one of two movies he made for 20th Century-Fox. A Grand Hotel type story from a novel by John Steinbeck about a group of people whose lives are changed on a bus trip in California, it is a patchy affair with an interesting cast that deserved a better script. 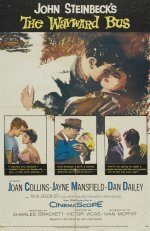 Jayne Mansfield gives a touching performance as a stripper who wants to become a "real actress", and there are good performances by Dan Dailey as a travelling salesman and Joan Collins as the driver's tipsy wife, but the superficial characterisation and pat situations leave them, like the bus on which they travel, on rocky ground.